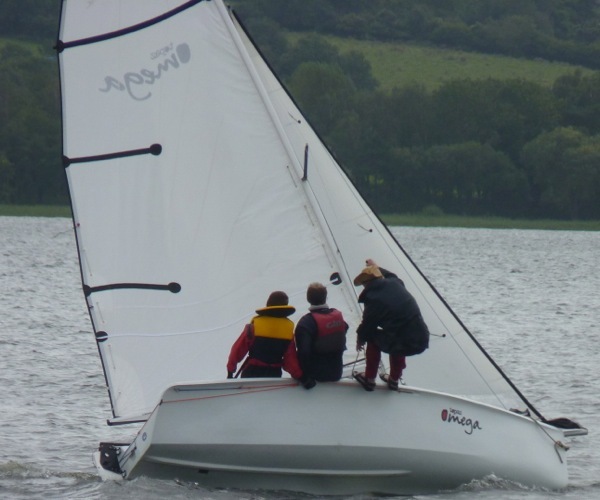 On Saturday the 1st of September 2012 CLADS held a fun day event at Chew Valley Lake Sailing Club. The weather was dry and, by the afternoon, quite sunny with a gusty wind at times. Three races were held throughout the day and I competed in my Topaz Omega Sport with Paul and Phil. Sailing with the Jennaker up. Race one went fairly well and whilst we were a bit behind we did manage to overtake he other boats. We managed to get an half decent Jennaker run near the beginning, but towards the end of the race we capsized when a gust hit us. Whilst we were first over the line we came about fourth due to handicapping. 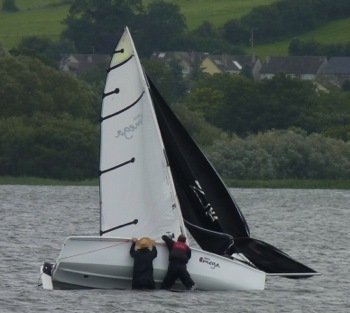 The second race was an slightly altered course, and we did capsize prior to starting. I suggested we should probably not use the Jennaker on the second race as the gusts were getting a bit stronger. Well, shortly after crossing the starting line, with the Jennaker up, things got a bit difficult. 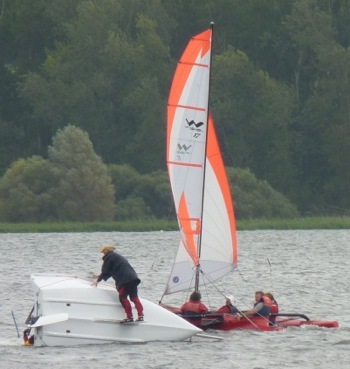 We ended up capsizing, just managing to avoid landing on a passing boat! With several attempts at bring back up we had to pull the Jennaker in whilst she was on her side. At one point I ended up underneath the mainsail and boom, not a nice experience, but I managed to escape. Once back up, with all three of us back on board, we decided to abandon the second race. Then we noticed a rope on one of the mast supports had broke. We managed to reach the pontoon so Paul could go ashore and get some more rope. 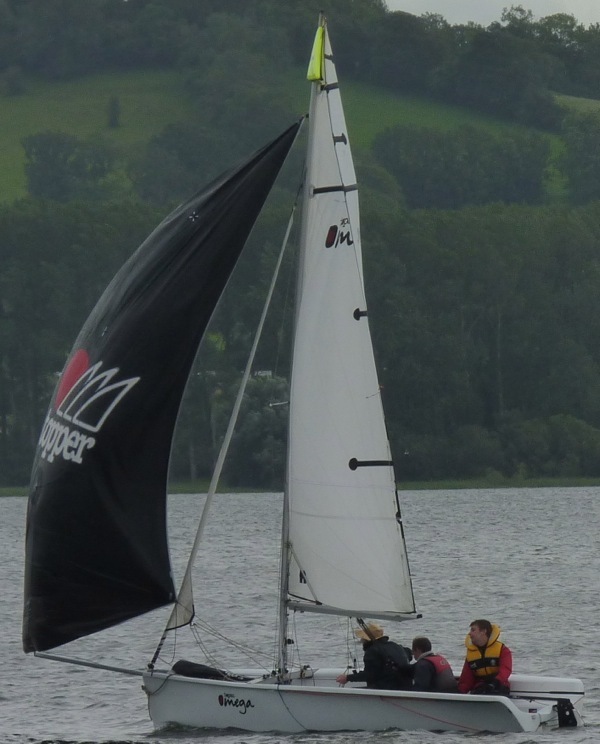 In the third race we decide to leave the Jennerka alone and just use the mainsail and jib. 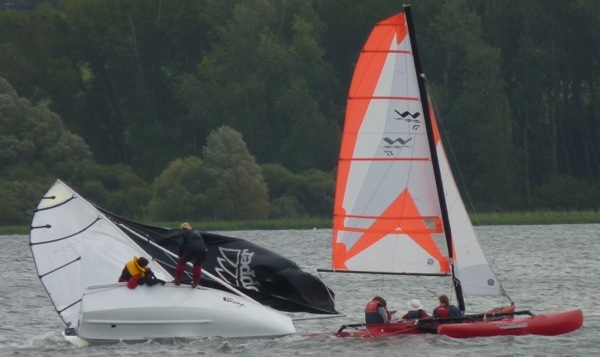 The race went much better for us and we avoided capsizing. Again we were first over the finish line but lost on handicapping. Whilst everyone enjoyed the day, we were worn out by the end of it!